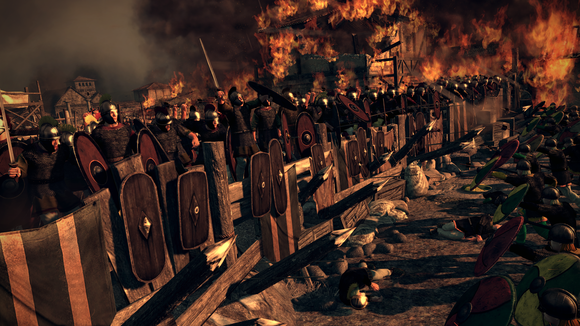 Can Total War: Rome II be saved? Has it been saved? I honestly don't know. I haven't gotten to play much of the recent Emperor Edition/Imperator Augustus expansion, and so I have no idea whether it managed to rectify what was a seriously broken game this time last year. Regardless, it doesn't matter. Creative Assembly is putting Rome II behind it and returning to the tortured, drawn-out death throes of the Roman Empire, last explored in the original Rome: Total War's Barbarian Invasion expansion. This time, however, it's encapsulated by the warfare and wanton destruction of Attila the Hun. 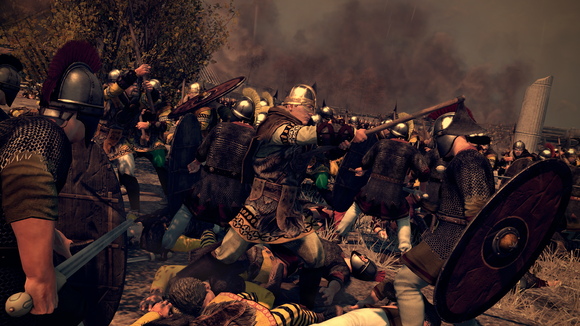 Total War: Attila puts players in the fifth century, attempting to rebuff Attila's campaign of terror and stave off the Dark Ages. Or not. You can also play as any number of "barbarian" tribes, attempting to hasten the fall of both the Eastern and Western Roman Empires and claim Europe/Western Asia for your own people. I'm not sure whether you can actually play as Attila, though the way Creative Assembly phrased things it sounds like the answer is no—he's merely a threat looming on the horizon. I got a brief demo of the game a few weeks back. For the most part, it looks a lot like Rome II. That shouldn't be too surprising, considering it's the same culture and region but a few hundred years later. In other words, don't expect an Empire to Shogun 2 or Shogun 2 to Rome II change. I'll go ahead and say that our look at the campaign map was hands-off. Thus I'm not prepared to comment on how long enemy turns took or anything of that nature. If those are the concerns you have (and they'd be justified, after Rome II) then I'm sorry I can't assuage your fears. That being said, the campaign map is very pretty. Creative Assembly has overhauled the map to reflect the nature of each region—dry and desert-like in Northern Africa, rainy and overcast in Britain, et cetera. They've also gotten rid of the weird restrictions they had on zooming out previously, so you can fly all the way out to an overhead view and get a view of your entire empire. That'll be handy to, for instance, keep track of the spread of diseases. Creative Assembly has done away with the squalor versus public order system of Rome II, instead hooking squalor to a new disease system. If squalor gets out of control in a city, there's a better chance of disease spreading. Once a city is diseased, there's potential to spread to other cities by way of trade or armies, which could be a good thing or a disaster depending on your intentions. Religion will also play an important part in Attila. You'll have your empire's religion, but also potentially pockets of dissenting religions, which can cause conflict in your holdings, similar to Barbarian Invasion. 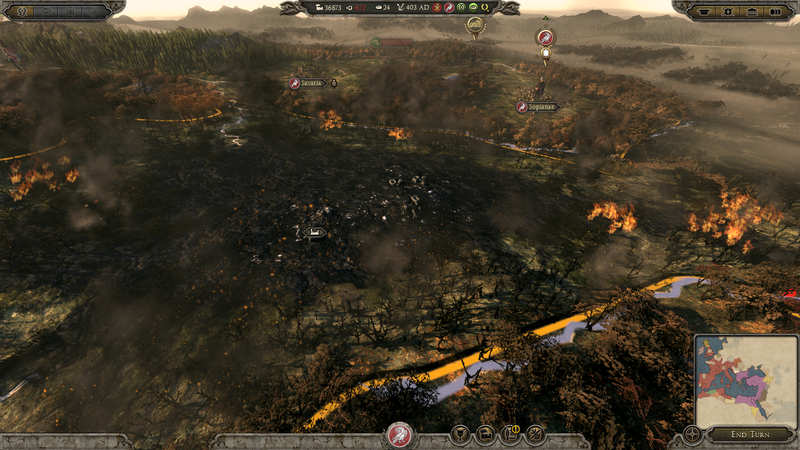 And in keeping with the Attila theme, you can now raze your own cities to the ground in what Creative Assembly termed "an ancient-world scorched earth policy." Outnumbered? Don't want your enemy to take advantage of that beautiful city you built? Burn it to the ground. Destroy it and don't look back. This both denies the enemy use of your city, forcing them to build up from scratch, and also damages the resource potential of the region temporarily. "Ancient-world scorched earth policy" in action. As far as smaller features go, Creative Assembly is overhauling tech trees and the building interface to make things (hopefully) less cluttered and easier to understand, though from my brief look at the game "easier to understand" also seemed to correspond with "fewer options." Again, however, I didn't get hands-on time with the campaign map so it's hard to know for sure. Some good news, though: Creative Assembly is bringing back family trees for leaders, which disappeared in Rome II. Also, there's an in-depth, shareable event log for those who like reading about stats. 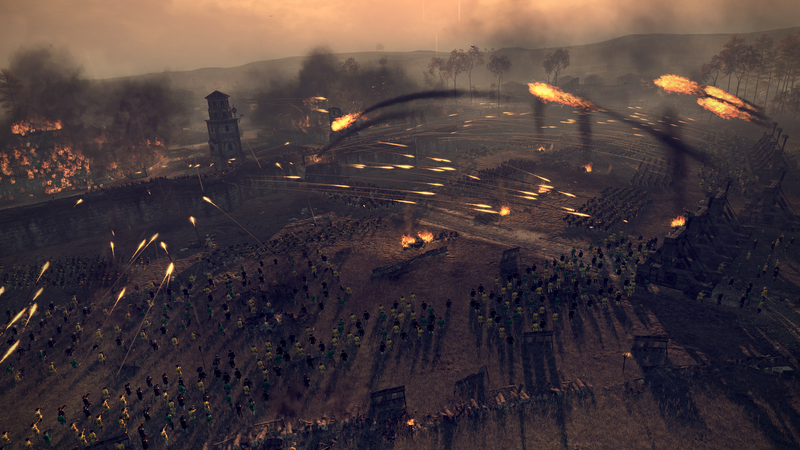 Creative Assembly specifically name-dropped Reddit and /r/totalwar in that regard. 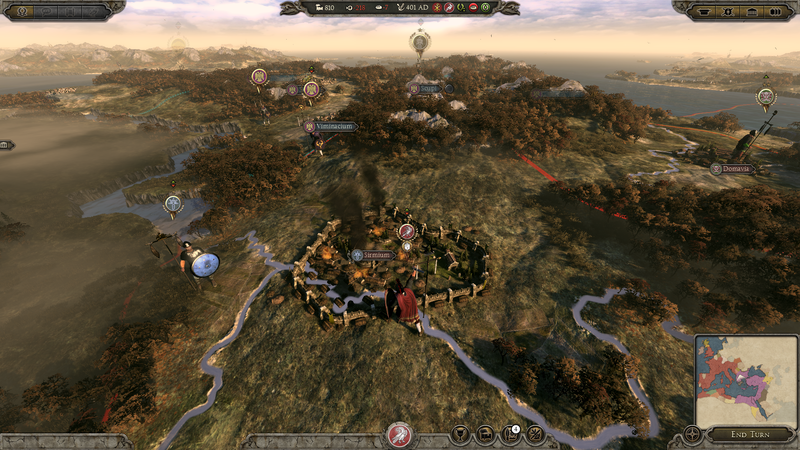 Creative Assembly dropped us into the middle of a battle for our hands-on demo. A battle where we were outnumbered two to one on defense. I played through the battle twice. I got murdered twice. The fine folks working the demo told me not to feel too bad—at the time we'd played, apparently only one person had emerged victorious. There are a few new battle features. Tying into the campaign map, there's now an increased focus on siege. Besieging a city for a few turns will now leave it in a partially-ruined state before you attack, making it easier to get inside the walls. 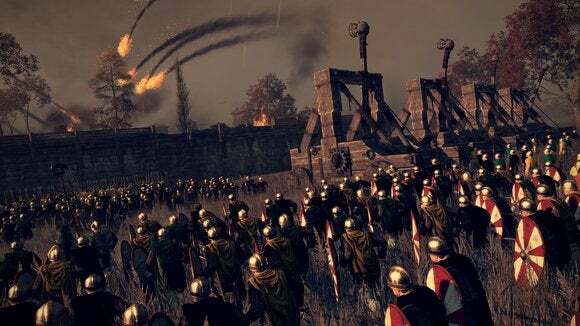 Considering Rome II was a nightmare when it came to attacking walled cities, this is a much-needed change. Fire also spreads dynamically now, both burning down structures and negatively affecting defender morale. But defenders have a few new tricks also. Though they weren't in our demo, city maps will now include civilian bystanders who might try and fight back against the invaders or, more likely, will simply run away. They exist, though! These cities aren't empty! Defenders can also set up barricades at predetermined spots during the deployment phase, both giving cover to troops and potentially herding the enemy down a specific path. What did it feel like to play, though? First of all, the battle we fought was (I believe) in England, and thus overcast. It was dark, and so dark it was a bit hard to keep track of what the hell was going on. Skirmishes between groups of troops just become a morass of bodies, which is certainly more realistic but a bit frustrating as a player who needs to see who he's controlling. The new barricades are an interesting idea, but they need some tuning as it's currently hard to tell when one's been overrun. Everything seems fine, and then suddenly you realize your entire three-deep ranks of archers is being destroyed. Still, it's interesting as a defender to have methods for herding enemies down specific streets—the potential for ambushes is a lot higher—and it gives archers a good vantage point to rain hell down on invaders. And some last thoughts: Ranged units feel overly powerful, horses are clumsy and unwieldy, and the graphics are beautiful. In other words, it's Total War. Expect this one sometime next year, if I had to guess—hopefully with a smoother launch than the last game.